Eli Wallach and Clint Eastwood in The Good, the Bad and the Ugly. By 1964, after barely two years, the Eurowestern was nearly at an end. This small, mildly successful genre had run out of steam, mostly because the films weren't much more than bad imitations of American Westerns. In this context, an obscure Italian director named Sergio Leone was charged with making a Western in Spain using left-over film stock and a handful of extras. With his meager resources, a script based on Akira Kurosawa's Yojimbo, and an American TV actor named Clint Eastwood, Leone created A Fistful of Dollars, a violent, cynical and visually stunning oater that quickly climbed to the top of the box office. This stark tale of a nameless drifter who pits two warring families against each other invigorated, and enlarged, the production of "Spaghetti Westerns" to the tune of over 600 films in eleven years. 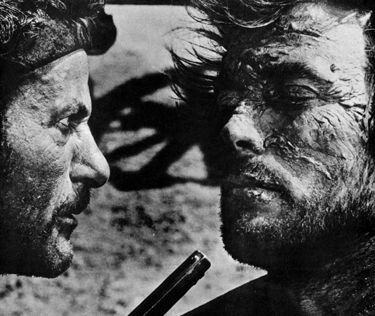 Leone crafted two sequels, each larger than the one before it -- For a Few Dollars More and The Good, the Bad and the Ugly. Both films saw huge box-office earnings and helped usher the Spaghetti Western into American theaters in 1967. At the time, American critics panned the films for their comic book approach, their disdain of American Western ideals, their excessive brutality, and their high body count. Despite the critics, The Good, the Bad and the Ugly quickly became possibly the most famous (or infamous) Western ever made, and critics now realize what the fans have known all along -- it's a classic. The relatively simple plot, set during the American Civil War, involves three men -- a Mexican bandit (Tuco Ramirez), a drifter (Blondie) and a hired assassin (Angel Eyes) -- in the quest for stolen Confederate gold buried in a cemetery. They form alliances as quickly as they dissolve them, all the while avoiding the ever-present war (at least until they wind up in a prison camp). The story unfolds slowly, establishing the plot with deliberate, intricate pacing. We are not even aware of the location of the gold until well over an hour has passed, but the proceedings give the whole film a grand sense of adventure. Eli Wallach, as Tuco, easily steals the show. He is at times a killer, a buffoon, and a con man, giving the film both its center, and its comic relief. Much of the film is devoted to developing his character, making good use of Wallach's acting talents. Wallach is primarily a stage actor and Leone was advised against hiring him for such a flamboyant role. Luckily, Leone ignored the advice, and Wallach turned in one of his finest roles in any venue. Lee Van Cleef's chilling portrayal of the murderous Angel Eyes has rarely been equalled. He coolly, and gleefully, dispatches anyone who gets in his way, after extracting everything they know about the gold. In one opening sequence, he shoots two men who have each paid him to kill the other -- "When I'm paid, I always see the job through," he says with a feral grin. In another, he brutally beats a woman in order to find the whereabouts of her boyfriend, and later orchestrates Tuco's torture to find out what the bandit knows. He finally sacrifices his gang to Tuco and Blondie, leaving only the three protagonists to meet in the final scene. Clint Eastwood plays the laconic Blondie. He knows the name of the grave where the gold is hidden. Keeping his secret is the only thing that spares him before the final reckoning. Eastwood handles the role capably, playing straight man to Wallach's shenanigans, remaining cool throughout the film, even with a rope around his neck. Much has been said of Leone's style. His use of extreme closeups, unusual camera angles, extended sequences, and music matched to the action, all motivated a change in how films are made. Leone liked things big, and he utilized all aspects of filmmaking to enhance his productions. The widescreen cinematography (by camera wizard Tonino Delli Colli) demands this film be seen only in that format. Scenes are carefully composed like paintings using the entire frame, and Leone studied the work of Civil War photographer Matthew Brady in order to give the film its unusually authentic look. Often, the camera moves on a dolly or a crane, revealing, sweeping, following the action, and it's done so artfully that it's never intrusive. Like so much of Leone's technical elements, the camera becomes part of the film rather than just a means of observation. His frequently uses closeups of hands, guns, and faces -- often showing just a pair of eyes, or the tip of a gun barrel. Leone's soundtracks are layered with buzzing cicadas, creaking doors, howling winds, and yapping dogs. Guns don't just go "bang"; they explode like howitzers. Bodies don't just fall; they crash into walls and tables or thud loudly upon the ground. Sounds are rich, amplified, and often startling. The epic battle near the film's conclusion is full of cannon and gunfire, clashing bayonets, and shouting soldiers, filling the air, surrounding the viewer with a barrage of sound. The music for this film remains Ennio Morricone's trademark score. Its strange opening theme is arguably the most famous piece of film music ever recorded. The music joins with the action in this film, becoming its own character, distinctive and full of melody. Each separate theme is an integral part of its specific scene, prompting some observers to remark that watching a Leone film is much like watching opera. Combining the cinematography, the sounds, and the music, Leone creates a film full of amazing set pieces -- Blondie's grueling desert ordeal, the appearance of the "Carriage of the Spirits," Tuco's mesmerizing run through the vast cemetery, and the final, decisive three-way showdown. The Good, the Bad and the Ugly is the quintessential Spaghetti Western, a perfect example of a genre once thought insignificant, but a genre which has been strongly influencing the film industry for thirty-five years.